Leading e-commerce company Flipkart has said if one goes by the gross merchandise value (GMV) transacted on its site in February, its annual sales have hit $1 billion (about Rs 6,000 crore). The company had set a GMV target of $1 billion by 2015. Others in the sector such as Myntra and Snapdeal, too, have projected $1-billion GMV by 2015. 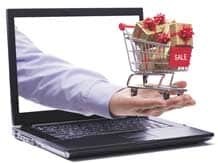 So far, no e-commerce company in India has notched up annual sales of $1 billion, a benchmark in the sector. In a joint statement, Flipkart co-founders Sachin Bansal and Binny Bansal said the company had "hit a run rate of $1-billion GMV one year before our target". However, the company's full-year sales for 2013-14 are unlikely to touch $1 billion, as it is taking into account the GMV for a particular month and making it a case for annual sales of $1 billion. Also, in February, Flipkart had carried out an exclusive launch of MotoG phones and had seen "traffic bigger than Diwali", according to Sachin Bansal. Flipkart, launched in 2007 as an online retailer of books, had recorded estimated revenue of Rs 2,000 crore in 2012-13. The company is yet to turn profitable. Last year, the company had raised $360 million. So far, it has secured $560 million from investors such as Naspers and Dragoneer Investment Group. Even as Flipkart has said growth, not profit, is its target right now, it has shifted its business model from an inventory-led one to marketplace-driven (considered a more revenue-efficient model). The marketplace model also allows companies to attract foreign investment; foreign direct investment is not allowed in e-commerce (inventory model). Recently, the company was in the news for proposing a merger with rival Myntra, though both the companies denied the move. In a recent interview with Business Standard, Sachin Bansal had said Flipkart wasn't looking at the next round of funding any time soon. An initial public offering "is the last thing on our minds right now", Bansal had said.